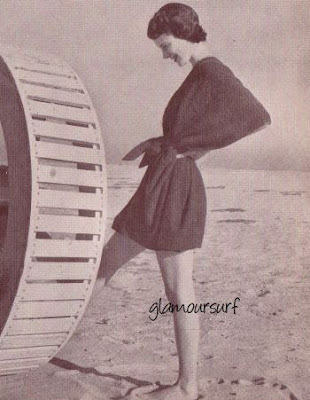 We conclude our 1950 For the Beach series today with a look at the Striped Shell, the Buttoned Maillot, The Nylon Tube and the Beach Stole Poncho as seen in Vogue 1950. 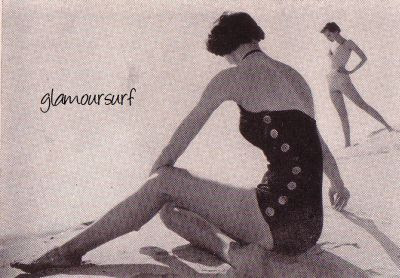 The Striped Shell, the Buttoned Maillot. 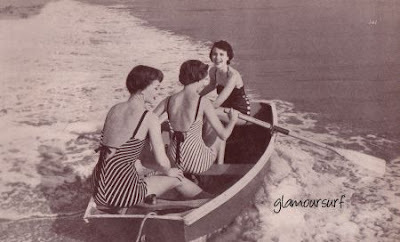 Two of the ladies in the boat wear bathing suits alike: one navy blue striped with white; the other, vice versa. By Catalina, in Celanese rayon with nylon and Lastex, $10; Saks Fifth. 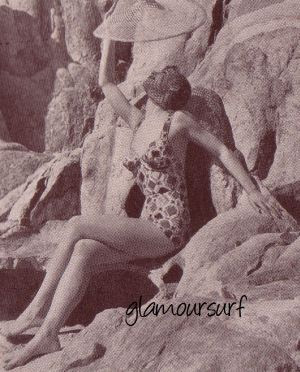 The Buttoned Maillot by Rose Marie Reid, a deep-fold bodice with straps to wear or tuck inside a loosely swathed torso. The closing line; dollar size pearl buttons. In Navy blue elasticized rayon satin, $25; Lord & Taylor. The Nylon Tube, in blue harlequin print. By Olga, in power net of DuPont nylon with Lastex, $25; Henri Bendel. Beach Stole Poncho, Bright green terry cloth stole, slit so that you can wear it as a poncho, $12.50; Bonzini.